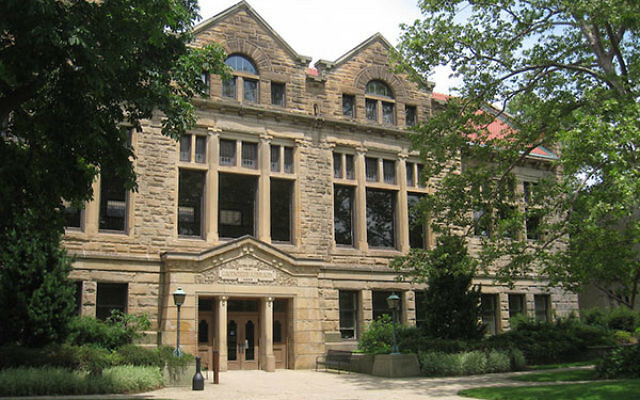 (JTA) — An Oberlin professor whose anti-Semitic social media posts outraged many alumni and faculty earlier this year has been placed on paid leave. The Cleveland Jewish News reported Wednesday that Joy Karega, an assistant professor of rhetoric, will not teach any courses at the Ohio liberal arts school until an internal investigation is completed, Oberlin President Marvin Krislov announced. Krislov’s announcement came two days after The Algemeiner, a Jewish news site, published an article noting that the administration had been quiet on the issue for several months. The article also noted that Oberlin Alums for Campus Fairness — part of a national network focused on fighting anti-Semitism and anti-Israel bias on campus — had sent a letter to the school’s board of trustees chair asking for an update on the Karega investigation and had not yet received a response. Karega has not apologized for her posts. Before the board of trustees called for an investigation, Krislov’s statements about Karega emphasized the professor’s right to free speech while clarifying that her views are not shared by the administration. Neither statement condemned the professor outright nor suggested her job might be affected.